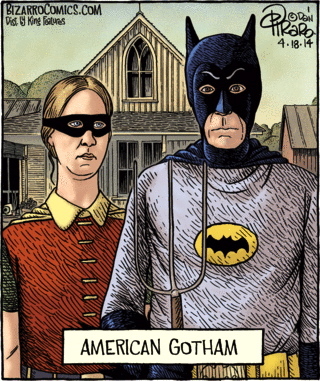 #2 shows a combination of two prominent images from popular culture, both very frequently parodied: the couple from Grant Wood’s American Gothic, and Batman, with a pun on Gothic / Gotham, Gotham City being the locale of Batman. Finally, in #3, another pun (mildly off-color) on plucked ‘with feathers removed’ vs. metaphorical fucked ‘ruined’. This entry was posted on April 18, 2014 at 7:22 am and is filed under Art/lit/music/film, Figurative language, Language play, Linguistics in the comics, Metaphor, Parodies, Pop culture, Pragmatics, Puns. You can follow any responses to this entry through the RSS 2.0 feed. You can leave a response, or trackback from your own site.